Columbia County, Pennsylvania, circa 1901. 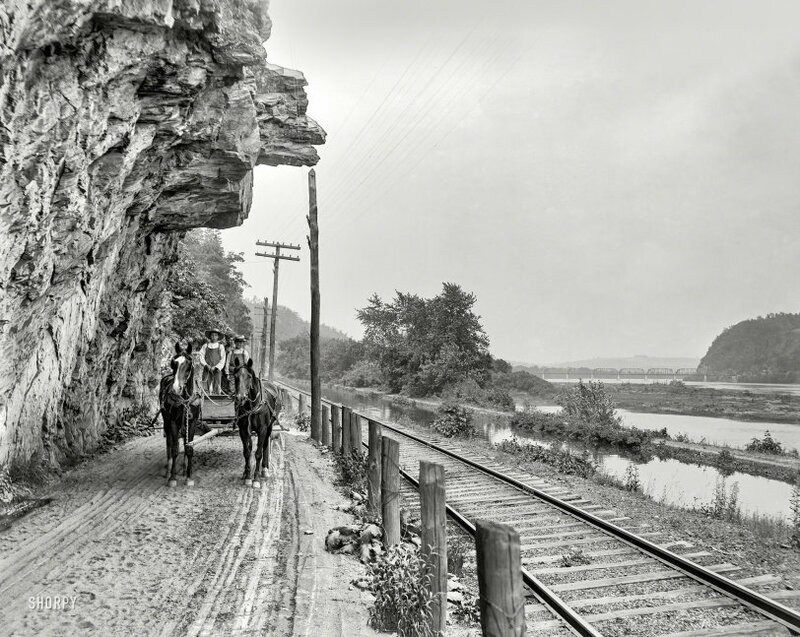 "Hanging rock on the Susquehanna, near Danville." A scene last glimpsed here. 8x10 glass negative. View full size. Submitted by jimboylan on Thu, 07/12/2018 - 5:05pm. The long multi-span bridge in the background looks like the Reading RR's Cataswissa branch crossing from Norca on the Catawissa side to Rupert on this, the Danville side. I agree, the railroad track must now be where the North Branch Canal used to be. Submitted by Jeffrey Jakucyk on Thu, 07/12/2018 - 4:04pm. Not quite as tight as it used to be. Mature Kids, or smart "cars"? Submitted by Dbell on Thu, 07/12/2018 - 9:10am. Very few modern cars know the way home, unguided. Submitted by damspot on Thu, 07/12/2018 - 8:57am. Those parents probably had a great deal of confidence in the team of horses as well as the kids. We used to nod off while riding and the horse continued on home all on its own. Try that with a Toyota. In any event, there were adults here, at least one, while this photo was taken. He's behind the camera. Submitted by jhmagill on Thu, 07/12/2018 - 6:13am. I know this rock formation very well. I grew up near where this picture was taken. Much closer to the town of Catawissa than Danville. Submitted by ka1axy on Thu, 07/12/2018 - 5:39am. If the kids forget how to get home, you can trust the horse(s) to know where their next meal is coming from. Submitted by Vintagetvs on Wed, 07/11/2018 - 7:59pm. I wonder how many parents today would feel comfortable handing over the car keys to their 10-year-olds and asking them to run to the store for bread.